Friday November 23rd 2018, 7.30pm. 7.5km, 200m climb. £1 entry on the day (but see below). Last entry 7.15. Same course as last year. 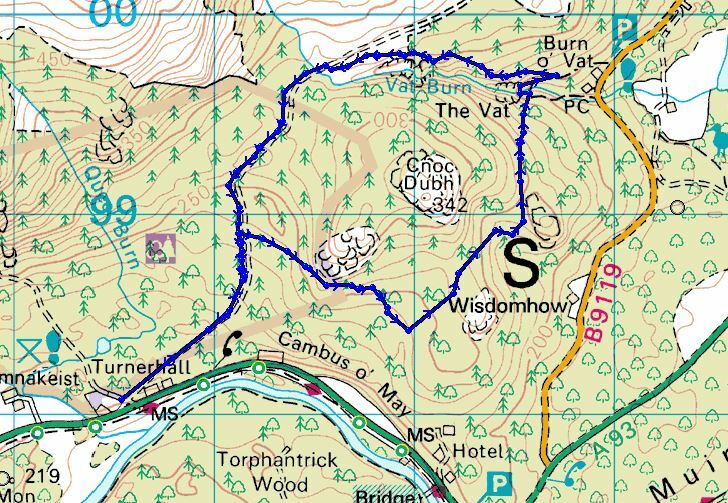 SNH don’t want us to go over the 300m contour because of capercaillie, so we run round Cnoc Dubh rather than not quite going to the top. Apart from 1km of forest road at the start and finish the course is all on narrow paths through the woods. Mostly good running but there are the usual rough bits with a few fallen trees, brashings and wet holes to fall in. The race starts and finishes at the Riverside Cottage cafe, Cambus O’May, on north side of the A93 mid way between Dinnet and Ballater. Registration and prize giving will be at the cafe, There is some parking here, but the forestry car park is only 300m away. The cafe will be serving teas, coffees, cakes and soup so bring some cash.